Q: Latvia's parliament on Wednesday elected Defense Minister Raimonds Vejonis as the new president. What is China's comment on that? A: The Chinese side congratulates Mr. Vejonis on being elected as the new president. China values its relationship with Latvia which maintains a sound momentum of development. We look forward to joining hands with the Latvian side to further deepen mutual trust, promote cooperation and advance China-Latvia friendly and cooperative relationship. Q: US Assistant Secretary of State for East Asian and Pacific Affairs Daniel Russel reportedly said on June 3 that China's territorial claims through land reclamation in the South China Sea posed a question about what kind of power China seeks to become. How does China respond? A: The answer is clear. China is a peace-loving country. We have successfully explored a path of peaceful development, and are on a new trail of win-win cooperation. The beaten track that a country will inevitably seek hegemony when it becomes powerful and that the winner takes all will never be our choice. China is and will continue to be the guardian of its own national sovereignty and security, the upholder of international justice and righteousness, and the promoter of world peace and development. Q: The Wall Street Journal carried an article on June 2, saying that China's forbearance has gone on far too long on the South China Sea issue. China does not intend to use its construction activities in the South China Sea to upset regional balance or to dominate regional affairs through military means. Rather, it is to restore regional balance. China's key problem is how to convince its neighbors that it has no intention to move from being assertive to being aggressive. What is China's comment on that? A: As a Chinese saying goes, a distant journey tests the strength of a horse and a long task proves the character of a man. 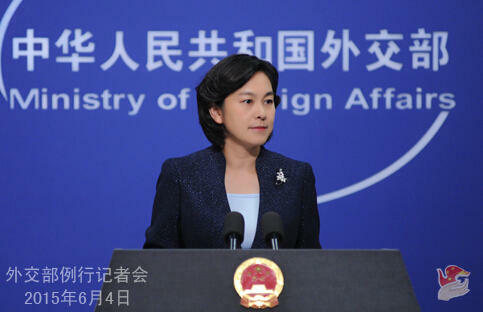 China's attitude on the South China Sea issue is responsible and its policy consistent, clear and unchanged. I want to reiterate that the Chinese side stays committed to safeguarding peace and stability of the South China Sea with ASEAN countries, resolving relevant disputes through negotiation and consultation with countries directly concerned, improving regional mechanisms and rules, including the full and effective implementation of the Declaration on the Conduct of Parties in the South China Sea (DOC) and the advancement of consultation on the code of conduct in the South China Sea (COC), and promoting common development and practical cooperation in the South China Sea in a bid to achieve win-win outcomes. Q: The Ukrainian military issued a statement on June 3, accusing the forces in eastern Ukraine of launching a large scale attack in breach of the ceasefire agreement. The head of the eastern Ukraine forces said that they had engaged only in defense measures after an all-out assault by the Ukrainian army. What is China's comment on that? A: The Chinese side follows closely the development of the situation in Ukraine and always believes that dialogue and consultation is the only way out for the Ukrainian issue. It is hoped that all parties could stay level-headed, exercise restraint, put into practice the consensus reached in Minsk on February 12, cement the ceasefire which comes at a great cost, and move forward the process of resolving the Ukrainian crisis through political means, so as to restore peace and tranquility to Ukraine at an early date.